Surprise! We've got one more Japanese imperial tiara to share before we switch our focus for the month to other imperial diadems. 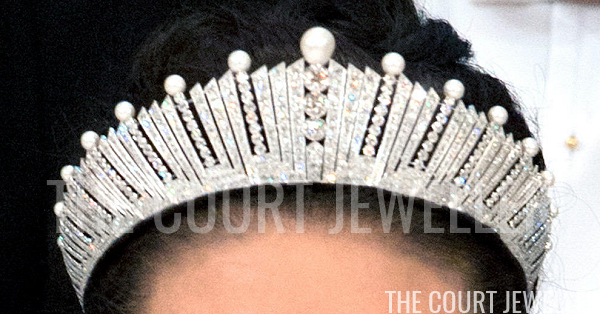 Today we're looking at one of the sleekest sparklers in the Japanese vaults: the Pearl Sunburst Tiara. 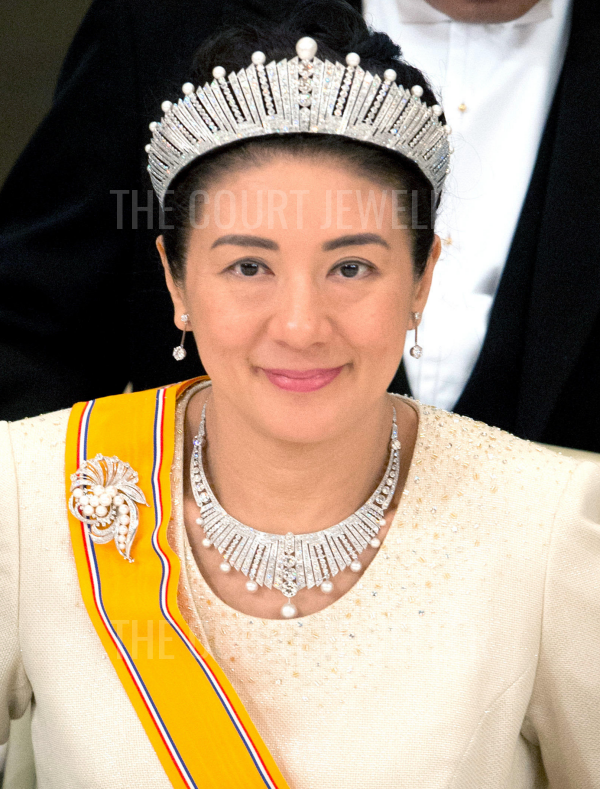 The tiara's deco-esque style suggests that it's a twentieth-century creation, and its first wearer appears to have been the country's current empress, the then-Crown Princess Michiko. She began wearing the tiara and its accompanying necklace and brooch almost immediately after her 1959 marriage to Crown Prince Akihito. Michiko wore the tiara during the 1960 Japanese visit to the United States; the moving images in this post show her wearing the sparkler while visiting President and Mrs. Eisenhower at the White House. She also wore the tiara and matching brooch when another American head of state, President Reagan, made a state visit to Japan in the 1980s. 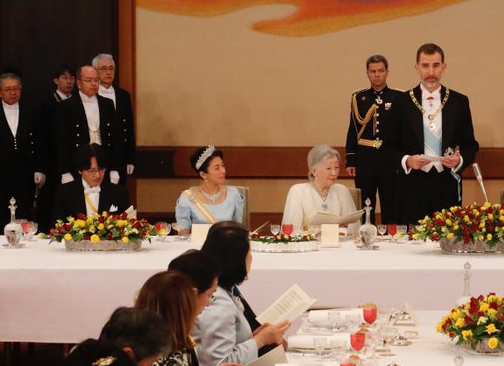 Masako tends to wear the Pearl Sunburst suite of jewels for all white-tie occasions now, including state visits and the annual New Year's reception (which she regularly attends, although she does not participate in the public ceremonial portion). Above, you can see the way that the design of the tiara is echoed in both its coordinating necklace and its coordinating brooch. This is one of my favorite pieces from the Japanese imperial vaults -- unlike so many of their tiaras, which tend toward the frilly and romantic, this tiara is basically the Chrysler Building in jewelry form. It nicely echoes the innovative, technological side of Japanese culture, and I'm glad we get to see Masako wear it more and more these days.